They plan to build a tourist camp where people can live like a real Maasai tribe. Using mud, sticks, grass, and more mud, Jack’s parents plan to build the Maasai mud-huts tourists will gladly rent to experience tribal life (and a fence to keep out the lions). The best part of their plans, the two adults believe, is they need no money to build their attraction—Mother Nature supplies the materials. Jack is not thrilled. He finally had a “normal” life, a home, parents who held down real 9-to-5 jobs, and a new friend—Diana. Once summer began to fade into fall, Jack’s parents could no longer do that “grind.” But this time things will be different: Jack’s parents will plan ahead, not take any risks, and not lose Jack. Changing their ways proves more difficult than the parents thought, as things do not go as planned, risks are taken, and, well, Jack . . . he ends up in a tree. 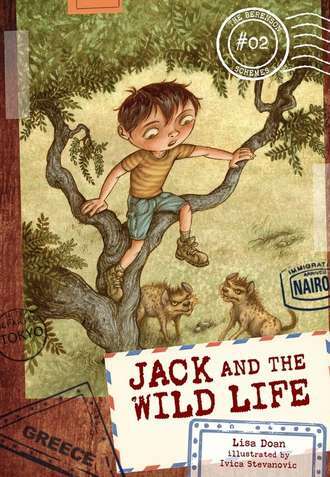 Poor Jack, now he is in Africa, stuck up a tree, while his parents—yet to realize Jack flew out of the rented Jeep—are trying to find the guide for their new camp. Jack must protect himself from animals on the ground and the ones that can get past the fence he built around the tree. He sleeps in the tree, eats in the tree, and fears for his life—and the life of Mack, Diana’s stuffed monkey—in the tree. The last time his parents had a get-rich-quick scheme, Jack feared for his life on a deserted island. 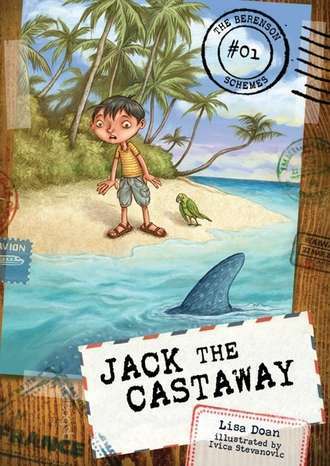 (#1 – Jack the Castaway reviewed here). The Berenson Schemes is a wonderful series, especially for kids that wish they could take control. With roles reversed, Jack acts more the parent, setting rules and following through. Meanwhile, Jack’s parents act more like spoiled, unruly children, who care about themselves first and Jack second. They do love their son, but cannot get it together as adults. 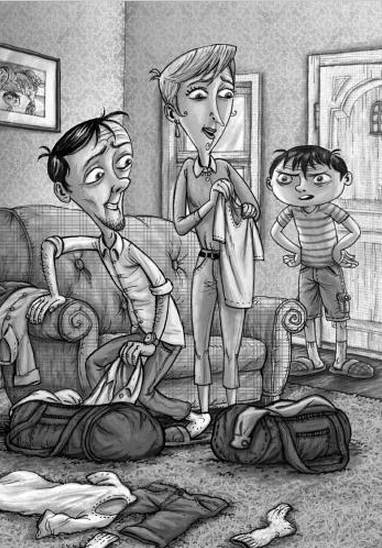 In book #2, Jack and the Wild Life, the family has new decision-making rules in the hopes that Jack’s parents will be parents that are more responsible. As Jack makes a tree-bed out of duct tape and reads his Kenya guide, he thinks maybe the rules are not working as he had hoped they would. I love the black and white illustrations. Stevanovic does a great a job of enhancing the story, giving readers a view into Jack’s situation and his emotions. I wish I had more images to show readers. The full-page illustrations are fantastic and have been in both books. By the end of the story, Jack’s parents may see the errors of their ways and promise Jack they will try harder to change . . . until the next edition, when they tire of being adults, devise a new scheme, and hook Jack into their plans. The Berenson Schemes #2: Jack and the Wild Life is great fun and I look forward to each new scheme and Jack’s consequences for merely being his parents’ child. Kids will love the mayhem Doan creates and the magic in Stevanovic’s illustrations. 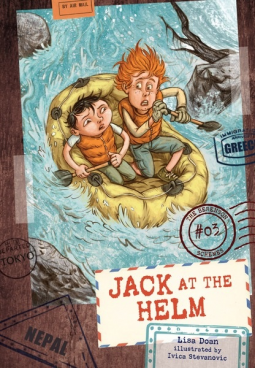 Book #3: Jack at the Helm, released this past March, 2015. JACK AND THE WILD LIFE (THE BERENSON SCHEMES #2). Text copyright © 2014 by Lisa Doan. Illustrations copyright © 2014 by Lerner Publishing Group, Inc. Reproduced by permission of the publisher, Darby Creek, Minneapolis, MN. Purchase Jack and the Wild Life at Amazon —Book Depository—iTunes—Darby Creek. 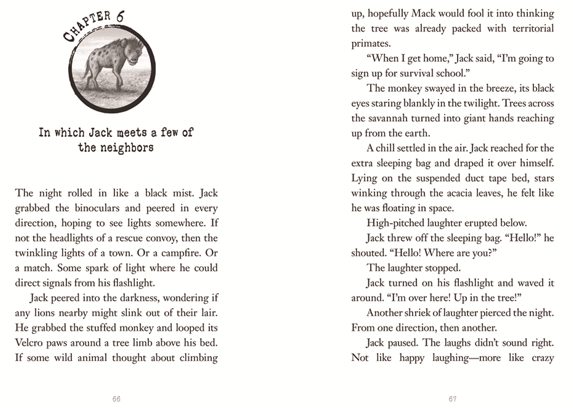 Learn more about Jack and the Wild Life HERE. CCSS Guide for Teachers HERE. Darby Creek is a division of Lerner Publishing Group, Inc.
Sue, This sounds like a great series. I love the idea that Jack needs to figure out how to survive, in spite of his parents. I bet my son would really enjoy this book (and series). Terrific review! Thanks. I think your son would love Jack and his inventiveness. Good, fast read, perfect for boys. (I should have said this).